A Shropshire law firm has taken a further step to strengthen its links with the armed forces. 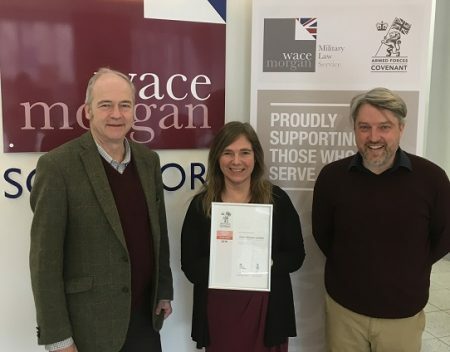 Wace Morgan Solicitors, based in Shrewsbury, has received recognition in the Defence Employer Recognition Scheme which encourages employers to support defence personnel and inspire others to do the same. The government initiative encompasses Bronze, Silver and Gold awards for employer organisations that pledge, demonstrate or advocate support to defence personnel and the armed forces community. “We have just received the Bronze Award and are working towards gaining the silver standard this year,” said Keir Hirst, a director of Wace Morgan who specialises in military law. “The Award demonstrates Wace Morgan’s commitment to those who serve, have served and their families” Keir explained. Any firms receiving the recognition must also have signed the Armed Forces Covenant, which Wace Morgan did in 2016. This acts as a promise from the nation that those who serve or have served in the armed forces, and their families, are treated fairly when receiving any public and commercial service. Wace Morgan also launched a new service last year, The Wace Morgan Military Law Service, which is designed to offer additional help and guidance to personnel. In addition the firm is a founder member of Forces Law, a national, independent network providing a wide range of services to meet the legal needs of serving personnel and their families, as well as retired service men and women. “We know that having a specialist knowledge of the unique legal issues raised in Armed Forces cases is a huge advantage and our new award will make us more visible and accessible, reaching out to an even wider range of service people,” Keir added.